by Catherine Hayes on March 29, 2017 » Add the first comment. Jan and friends have fun in the photo booth at Young Audiences’ 2016 Gala. 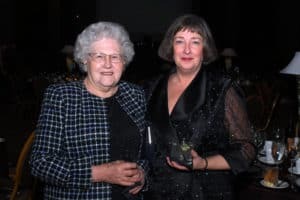 When Jan Robertson recruited advertising and public relations executive Meridel Prideaux to judge her daughters’ elementary school art contest, she didn’t expect it would launch a 20-year journey as a board member for Young Audiences of Oregon & SW Washington. But that’s exactly what happened when Meridel introduced Jan to Young Audiences’ then-Executive Director, Sarah Johnson. On May 4, Young Audiences of Oregon & SW Washington will present Jan with the 2017 Sunburst Award to celebrate her 20 years of board service and arts-in-education advocacy. We sat down with her recently to reflect on her 20 years with Young Audiences. Young Audiences: Why do you think arts education is important? Jan Robertson: I think it is critical to offer students various ways to express themselves, appreciate talent in others, and participate in something that is not test based. Art education also offers opportunities to share culture and traditions in formats far more robust than textbooks. Most importantly, the arts are a way for students to recognize how things connect, share in the experience of creating something new together, or encounter moments so beautiful they get goosebumps. YA: Do you have a favorite memory from Young Audiences? JR: After 20 years, there are so many moments it is hard to pick just one. One teacher shared an especially memorable moment of a field trip to the zoo with a student who struggled with focus and settling down. The teacher learned her student thought he had found the tree in the Monet painting they had studied sometime as part of a Young Audiences visual arts residency. The teacher hadn’t thought he was paying attention during the residency. Both the student and teacher shared an incredible moment witnessing the beauty of the tree before them and the tree they remembered. Both were changed by the experience and likely would never forget that particular Monet paining as a result. I have loved many visits to schools to see our artists perform and watch the magic happen as they share their talents with the students. Even more, I have loved seeing students share their works of art with classmates. It happens over and over and never gets old. YA: In 2000, Jan joined the board of Young Audiences’ national organization. We asked her what interested her in that board? JR: The first time I attended a National Conference was here in Portland in 1999. I was blown away by the quality of the attendees, national board members, affiliate board members and staff; and learning about all the great work and ideas happening across the country. I had already been very involved with our affiliate and soon thereafter was elected to a position as a “Regional Representative” to the board for the West, and moved a few years later to be the Network Assembly President. When that term ended, I was elected as full member to the board. Over the years the passion and commitment of the national board has never faltered, and I have made some incredible friends, in fact some of my closet friends. YA: Are there any accomplishments that stand out for you during your tenure? JR: Here in Oregon & SW Washington, Young Audiences’ work has been so important reaching over 70,000 students every year. I have great appreciation for all the board and staff I have been able to work with in this community. At the national level, I have served on many committees and task forces and am always proud when I feel I am able to contribute in a meaningful way. The work we did on several emotionally charged items: strategic planning, new affiliate agreements, the search committee that found our wonderful national executive director, have been especially gratifying. Please join us on May 4 at The Nines for our gala, Fly Away with YA, where we will present Jan with the 2017 Sunburst Award. Click here to purchase your tickets. Can’t make it? Please consider making a gift in honor of Jan by clicking here.